The heyday of O-gauge model railways was in the 1920s and 1930s. Arguably, its very size contributed to its eventual decline as the space needed for any decent model layout was on the large side and naturally excluded many from building anything but the simplest of layouts. The early O-gauge models were clockwork-driven but later ran on electricity. Their large size allowed many manufacturers to produce very accurate replicas. While O-gauge certainly heralded in the concept of indoor model railways, the very excitement of owning and running your own railway opened up the market for cheaper and smaller scale models, which Frank Hornby and others were quick to fill with their OO and HO gauge models. In terms of the the auction market, O-gauge model railway items can largely be split between British and Continental manufacturers. Frank Hornby dominated the British O-guage model railway scene in terms of pieces produced, providing affordable toys for the masses, while Bassett Lowke concentrated on the high-end of the market producing very well-engineered models that appealed to serious enthuisiasts who valued their accuracy and could afford their high prices. An Ace Trains 3RE Class E/5 0-6-0 locomotive (No 30548) with six wheel tender in British Railways (BR) black livery, unboxed (SC20/1173). Both manufacturers focussed their production on the British railway companies of the time: the London Midland and Scottish Railway (LMS), the London and North Eastern Railway (LNER), the Southern Railway (SR) and the Great Western Railway (GWR); and on British Railways (BR) in the post-war period after nationalisation in 1948, although O-gauge was already in decline by this point. Both Hornby and Bassett Lowke produced fine locomotives, carriages and other rolling stock as well as track side accessories - in fact, everything needed to replicate the real railways of the day. 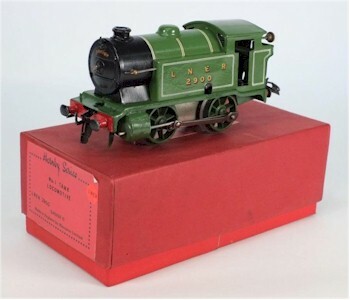 A repainted Hornby 0-4-0 tank locomotive No 2900 in London North Eastern Railway (LNER) green livery (SC20/1172). The continental market was dominated by the German manufacturers Marklin and Fleischmann. Markin started production in 1891 with a clockwork model while Fleischmann was initially founded as a toy company by Jean Fleishmann in Nuremberg in 1887 before producing its first O-gauge model in 1938. There is little doubt that the German manufacturers were better than their English counter-parts in terms of engineering quality. In fact, such was the German's manufacturing prowess that both Marklin and Fleischmann actually produced models for their English rivals such as Bassett Lowke. Continental O-gauge railway items coming to market can make small fortunes at auction and are highly collectable, partly reflecting the German eye for detail with everything from station buildings to rolling stock being exquisitely modelled right down to candles in latterns and the like. ETS (Czechoslovakian) O gauge rolling stock includes a No 468 'United Dairies' tanker, No 434 Banana Refrigeration Car, No 469 'Castrol' Oil Tank Wagon, No 403 GWR 'Gondola' Freicht Wagon and No 307/BB Passenger Wagon, all boxed (SC20/1174).